It’s Valentine’s Day – the most romantic day of the year where it’s become almost customary to send cards, chocolates or flowers to our loved ones. Forget the dreary dull skies of England, Spain has an average temperature of 25°C (77°F), which means it’s basically hot and sunny most of the time. In fact, most areas in Spain enjoy around 300 days of sunshine each year! Could you think of a more perfect destination? You’d struggle to find anyone who didn’t love the weather here. Did you know Spain has one of the longest coastlines, stretching over a whopping 4,964 kilometres? That’s not all. The Mediterranean Sea actually surrounds the country on three sides and boasts almost 3,000 beaches – 577 of which were awarded blue flags in 2015. With all that sand, you won’t ever have to worry about finding a spot to pop your towel down and soak up some sunshine. Think of the romantic walks along the beach at sunset – perfecto. The Spanish architecture has us head over heels in love. The country is home to some truly incredible structures, which offer some fantastic photo opportunities. For example, you can visit the Mezquita in Cordoba, one of the most spectacular mosques in the world, or take a visit to some of Gaudi’s architectural masterpieces. Spain also has the third most UNESCO world heritage sites in the entire world, so you won’t run out of stunning architecture to visit anytime soon. Famous for its food and drink (think Sangria and Gazpacho), Spain has a wide variety of amazing delicacies for you to try. You can become a pro at sampling local variations of Paella, eat churros with chocolate in the morning and drink some of the best wine produced in the world. Some bars even provide you with free tapas when you order a drink! Of course, if you’re looking for something a little more exotic, you could always dine in the oldest restaurant in the world (Casa Botin was founded in 1975) or even eat chicken that has been grilled over an active volcano in Lanzarote! The cuisine really is amazing. Spain really is the place to be if you’re a sports fan; whether it’s golf, formula one or football, there’s something for everyone. Football is the national sport, with two of the biggest football clubs in the world situated here (Real Madrid and FC Barcelona). Pretty much everything grinds to a halt when a big game is happening. F1 is a pretty huge deal too. Every year the Spanish Grand Prix is held at the Circuit De Barcelona-Catalunya, which is attended by thousands. If your love of golf is greater than other sports, you’ll be pleased to find some of the world’s best golf courses here, including PGA Catalunya Resort and Las Colinas. There’s plenty going on in Spain to be a part of. There’s a huge community spirit which we absolutely adore, evident in the multitude of festivals that take place throughout the year. For example, at the Las Fallas Festival you can expect plenty of fire and papier-mâché figures relating to San José (Saint Joseph), while at midnight during the Tamborrada Festival, the mayor raises the city’s flag to start 24 hours of non-stop drumming. One of the most famous festivals however, has to be La Tomatina – an annual celebration where everyone gets together to throw tomatoes at one another! Whilst throwing food isn’t necessarily a romantic activity, you’ve got to love Spain for its tradition and most of all, its passion! From living costs and life-span to property prices and lifestyle, Spain has it all. For starters, Spain is one of the least-expensive countries in Western Europe and constantly tops the lists of European countries for increased property values – great news if you’re planning on buying property here. On top of that, the Spanish healthcare system is renowned for being amongst the very best in the world and their life expectancy is also very high. Coupled with amazing public transport and endless space to relax in (Spain is five times as big as the UK with only 2/3 of its population) this really is the best place to live. What’s not to love? You won’t ever run out of things to do and see in Spain – part of the reason we love it here so much. You can visit the Egyptian temples (a gift from Egypt in 1968), check out Salvador Dali’s home and his art, and even make a stop at the Bandit Museum, the only museum dedicated to bandits and highwaymen in Spain. Don’t forget to visit Andalusia where you can discover the famous whitewashed towns or ‘pueblos blancos’ which are dazzling against the Spanish countryside. In Spain, national holidays are celebrated just a little bit differently to ours. Take the New Year for example, the tradition is to eat one grape with your family for every strike of the clock. Valentine’s Day is called Diada de Sant Jordi and is celebrated on 23rd April instead (so if you’re reading this and are moving to Spain shortly, you could technically celebrate twice!). Known as the most romantic day of the year, men give their sweethearts a rose, and women give a book. Finally, Kings Day (where the Three Kings deliver gifts on January 6th) is an even bigger deal than Christmas. Whatever your tastes, there really is something for everyone to do (especially if hitting the beach isn’t your scene). You can visit some spectacular mountain ranges, discover a range of beautiful marinas, or head over to one of the many water parks dotted all over the country. Failing that, you could always nip over to Portugal instead; there’s a 2,365 zipline connecting the two countries and it takes just 60 seconds to get there. We simply love Spain for its variety. 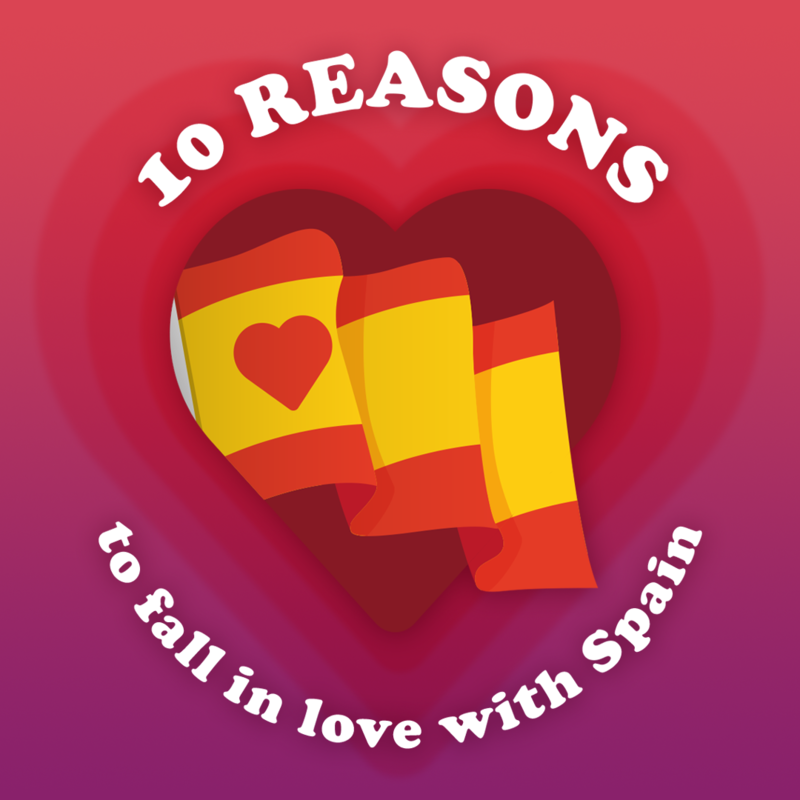 So, there you have it, our top 10 reasons to fall in love with Spain. If you’re considering swapping the UK for a new life in Spain, contact our team today. No matter what stage of your journey, our team can help you find your perfect property in a location you love. Not to mention a fantastic aftercare service which will help you settle into your new home in no time. Call us today on 0800 011 2639 to book your viewing trip and start your new life in the sun.